Exeggcute is not terrible. 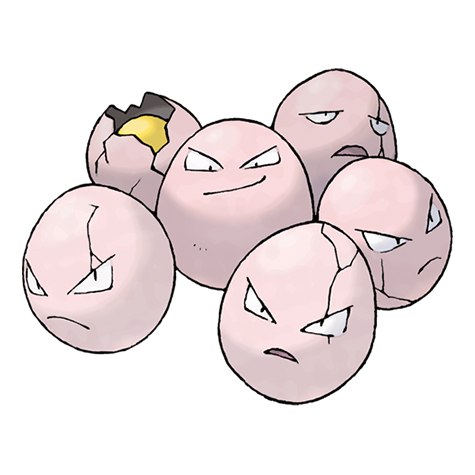 I love eggs; they're delicious, and that's clearly what Exeggcute is--half a dozen eggs. I mean, it's got "egg" in its name. Very clever, Game Freak. It's also got decent stats and evolves into Exeggutor, which, while one of the ugliest Pokemon in the game, is considered one of the best and something most everyone would consider having on their team. Sort of like Joakim Noah. Exeggcute loses some points for a number of reasons, though. For starters, a third of these eggs look bad. They all have cracks in them, but we'll overlook that because the two in the back look terrible. One is half-broken, while the other is either bemoaning a lost lover or drunk (or a combination of both). Secondly, the only way to catch an Eggsy is in the Safari Zone. For those who haven't played the game, the Safari Zone is this little area where you're limited in the number of steps you can take, and only get special "Safari Balls" to catch things with. I think you can also throw food and rocks at the Pokes, with varying success. But you can't actually attack them, put them to sleep, or any of the other normally fun things to do whilst battling. Which makes Exeggcute really hard to catch, and we don't like difficulty in our Pokemon games. Finally, Eggsy is just not all it's cracked up to be (an egg related pun, who'da thunk it?). It learns a plethora of fairly inaccurate moves--some will still probably make it onto your final version, like Stun Spore--but overall, its natural moveset is kind of limited. I know, I know, you can use the MissingNo. cheat to gain unlimited TMs, but if we're playing honestly, you can't, and I'd like my Pokes to at least have two good moves they learn naturally. Eggsy ain't got that, so that's why he ain't high up on this list.